After years of working with some of the greatest drivers in the world, Carroll explains how the best use their car to greater effect than the rest. 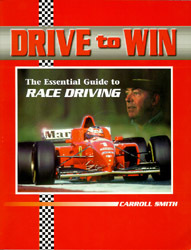 "80% of success at motor racing is knowing how to go motor racing properly." "Motor racing has had its fair share of shooting stars - drivers who burst on the scene, shone brightly for a brief time, and then, for various reasons, disappear. Those who lasted - the great multi-champions - have been, almost without exception, astute and serious students of the game."